We all know that people like dealing with other people. Even with good intentions, joining conversations as a fan page still comes across as spam. 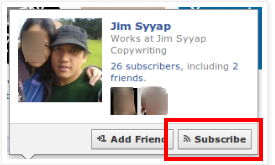 What I am doing now is looking for ways to subscribe to the more influential profiles on Facebook. These are the people who have more than twenty others subscribed to their status updates. As such, you get their updates on your news feed and gives you the opportunity to join the conversations. What makes this work is that, whenever you offer value in these conversations, people are going to mouse over your profile and see what it is you do. When you mouse over any profile name on Facebook, the image above will show up. 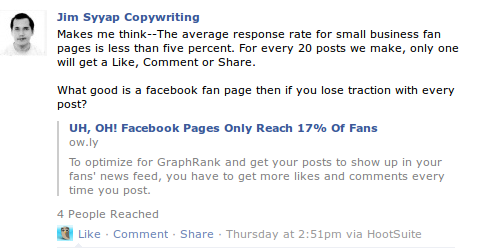 As you can see, this gives readers three ways to connect with me--Add Friend, Subscribe, or by clicking on "Jim Syyap Copywriting" which will give them my Facebook fan page. If you are consistent in providing value on Facebook, people will want to connect with you. The safest way for them to do this is by first subscribing to your status updates. Just like in twitter, when someone follows you, you can choose to follow them as well. 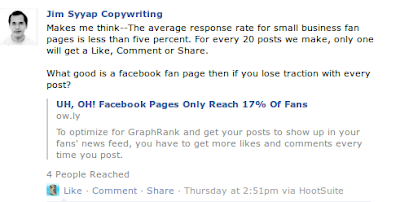 This opens the door for you to widen your reach with their social network. For this to work, remember to ALWAYS offer value. Never pitch, no hard sell, and definitely no spam. Try it for 30-days and let me know how this works for you.